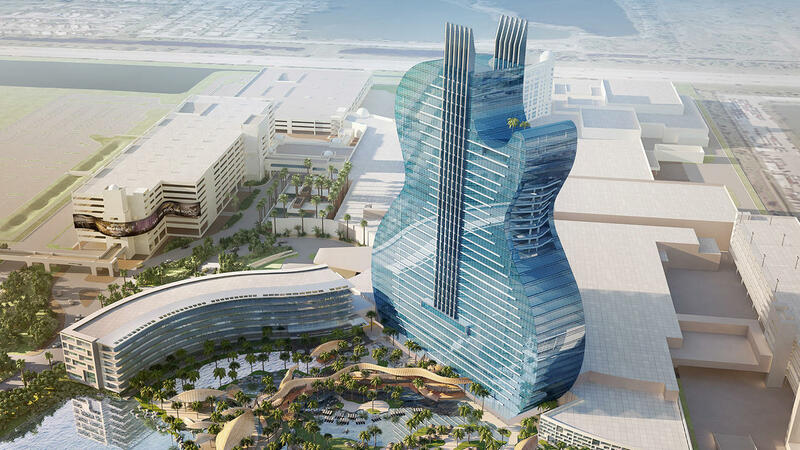 Hoteliers and musicians smashed guitars in Hollywood, Florida to celebrate a construction milestone at the Seminole Hard Rock Hotel & Casino, a $1.5 billion entertainment complex featuring a mega guitar–shaped hotel. The 450-foot-tall hotel will boast more than 600 rooms, around half of the complex’s total, plus a 41,000-square-foot spa and a few restaurants. At the tower’s base, guests can swim underneath waterfalls in plunge pools, relax in private cabanas, and partake in water sports in a giant artificial lake. Right now, the existing Seminole Hard Rock Hollywood hotel has almost 500 rooms, as well as a casino, meeting space, restaurants, and a lagoon pool. Guitars are a popular motif all over the Hard Rock hotel and restaurant empire, but this is the first of the company’s buildings to so closely resemble the actual instrument. Vertical fins up the tower’s midline resemble strings, while horizontal banding act as ‘frets’ (though unlike real frets they extend outward to mimic the curve of the instrument). Though it might be the largest guitar building, it might not be the first. In 1996, architect Glenn Williams designed a Guitar House for himself in Venice, California that was inspired by Picasso’s cubist rendering of the instrument. The Architect’s Newspaper (AN) has reached out to Seminole Hard Rock Hollywood for more details on the building’s design and construction, and will update readers as more information becomes available. Footage from the October 25 event showed workers atop the first few swishy floors. “To do this…to have a guitar shaped hotel—the only thing I’m a little concerned with is it’s not a drum!” joked Nicko McBrain, a resident of nearby Ft. Lauderdale and a drummer in the British metal band Iron Maiden. The hotel opening is slated for summer 2019, but the complex’s revamp goes way beyond its signature structure. In March, the 5,500-seat onsite theater will be demolished and replaced by Hard Rock Live, a 7,000-seat, $100 million venue. The casino will double in size, too, and the Seminole tribe is adding meeting space and 60,000 square feet of new retail and restaurants. The projects are timed to open before 2020, when NFL championship teams will face off at the Populous-designed (and HOK-renovated) Miami Dolphins stadium.